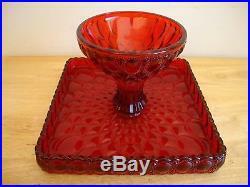 Elegant Mosser Square Ruby Red Elizabeth Cake Pedestal, Stand, Plate, Dish! 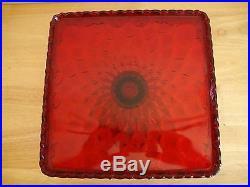 This Wonderful Square Red Glass Elizabeth Cake Plate stands 6-1/4" and is 10" square. The Pedestal is all Ruby Red Glass. The intricate detail of the Beaded Oval around its scalloped valance as well as its pedestal base. The graduated beaded oval detail on its base is absolutely breath taking! This gorgeous "Salver" is made by Mosser Art Glass. 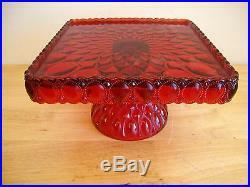 This cake stand is very heavy, the glass is 1/4 thick. Small bubbles and variations are an inherent part of true handmade glass and should not be considered flawed. Each piece is indeed a one of a kind piece unlike automated glassware. It is in excellent condition with no chips, dings or repairs. 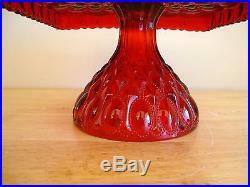 It would make a wonderful muffin stand or petite fores pedestal. A Beautiful addition to your table setting! 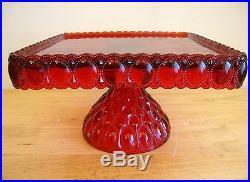 The item "Elegant Mosser Square Ruby Red Elizabeth Cake Pedestal, Stand, Plate, Dish" is in sale since Tuesday, March 06, 2018. 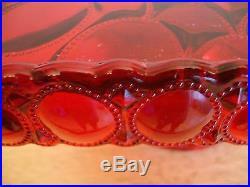 This item is in the category "Pottery & Glass\Glass\Glassware\Contemporary Glass\Mosser". The seller is "coviper69" and is located in Rockwood, Michigan. This item can be shipped to United States, Canada, United Kingdom, Denmark, Romania, Slovakia, Bulgaria, Czech republic, Finland, Hungary, Latvia, Lithuania, Malta, Estonia, Australia, Greece, Portugal, Cyprus, Slovenia, Japan, China, Sweden, South Korea, Indonesia, Taiwan, South africa, Thailand, Belgium, France, Hong Kong, Ireland, Netherlands, Poland, Spain, Italy, Germany, Austria, Russian federation, Israel, Mexico, New Zealand, Philippines, Singapore, Switzerland, Norway, Saudi arabia, Ukraine, United arab emirates, Qatar, Kuwait, Bahrain, Croatia, Malaysia, Brazil, Chile, Colombia, Costa rica, Dominican republic, Panama, Trinidad and tobago, Guatemala, El salvador, Honduras, Jamaica, Antigua and barbuda, Aruba, Belize, Dominica, Grenada, Saint kitts and nevis, Saint lucia, Montserrat, Turks and caicos islands, Barbados, Bangladesh, Bermuda, Brunei darussalam, Bolivia, Ecuador, Egypt, French guiana, Guernsey, Gibraltar, Guadeloupe, Iceland, Jersey, Jordan, Cambodia, Cayman islands, Liechtenstein, Sri lanka, Luxembourg, Monaco, Macao, Martinique, Maldives, Nicaragua, Oman, Peru, Pakistan, Paraguay, Reunion.